Creatives used to spend countless hours designing a few pieces of choice content for a small number of specific channels. With the advancement of digital technologies and processes, creatives are having to create more varied pieces for more platforms than previously. What does that mean for creatives and brands? Luckily, the evidence points to the fact that high-quality, audience-focused content is more in demand than ever before. MDG’s infographic, How Digital Has Transformed the Creative Landscape, highlights five ways in which digital is changing the creative game. These insights are valuable for marketers and brands in terms of generating a deeper understanding of what audiences want, the tools available to meet those demands, and how digital will continue to shape the landscape in the coming years. So, how has digital revolutionized creative in the past few years? Today, creative comes in a plethora of formats for use on a variety of different platforms, and this is largely due to digital. Before, creatives were tasked with creating one piece of creative for one place, but due to the increase in the number of places consumers get their information, brands now need to engage with customers in a whole new digital world. Just take one look at the list of formats and platforms below and you start to get the idea. With 70% of creatives saying it’s important to personalize content around the customer journey, marketers are facing an increased demand to develop content that’s personalized to the customer. When you consider that 65% of creatives are developing more content now compared to 5 years ago, and 60% are spending more time creating that content, it seems clear that personalized, customer-centric content is key, and lots of it. There is more demand from consumers for relatable content and that’s good news for creatives, because while digital is increasing that demand, it’s also making it easier to deliver. Take programmatic ad buying as an example. This digital process allows companies to buy digital advertising space in real time and target the right audience on the right platform, meaning no more headache-inducing purchasing processes. But, don’t just take our word for it, listen to the 81% of companies that are using some form of programmatic buying of advertising already With that many companies already on board, this digital innovation seems to be offering users some pretty valuable benefits. The changes digital has brought to the creative landscape extends beyond how pieces are distributed and also addresses how those pieces are created. Tools in the form of hardware and software are making it easier for people to develop content that fits very detailed specifications. In fact, 69% of creatives say they are using different tools compared with 5 years ago. These new tools, while making it easier to develop content, also make collaborating essential to the success of campaigns. Creatives definitely agree, and 73% think being able to collaborate easily is very important. Lastly, digital has done a very efficient job at democratizing creative. Essentially, anyone with access to a smartphone and social media can share content on a variety of platforms in a variety of ways. Consumers and creatives alike have responded and a flood of content is produced every single day. 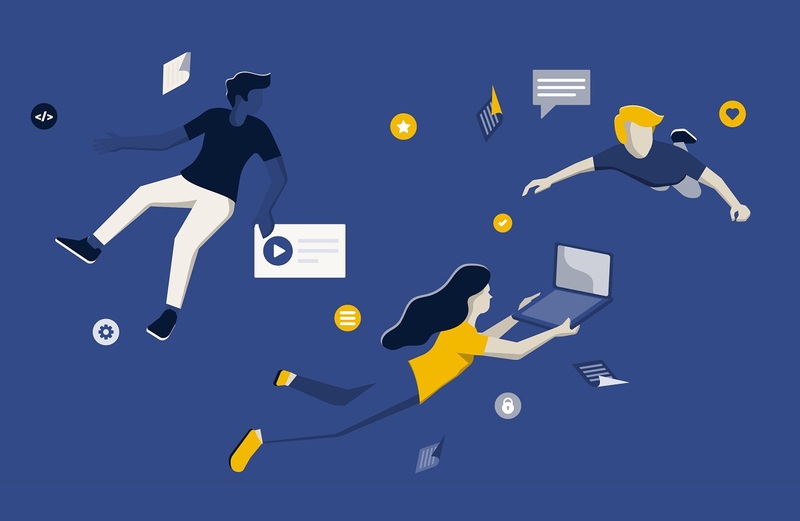 In transforming the creative landscape, digital has made it easier for creatives to create and distribute meaningful content on a variety of platforms. And, automation and AI continue to advance and become more accessible, the possibilities for interactive engagements might just be endless. Most of all, it’s important to point out that creatives and their many talents are more in demand than ever before, and not much trumps thoughtful, personalized creative.